Who won NSW election? Gladys Berejiklian claims victory. Gladys Berejiklian claims victory and becomes the first woman to win a NSW election. 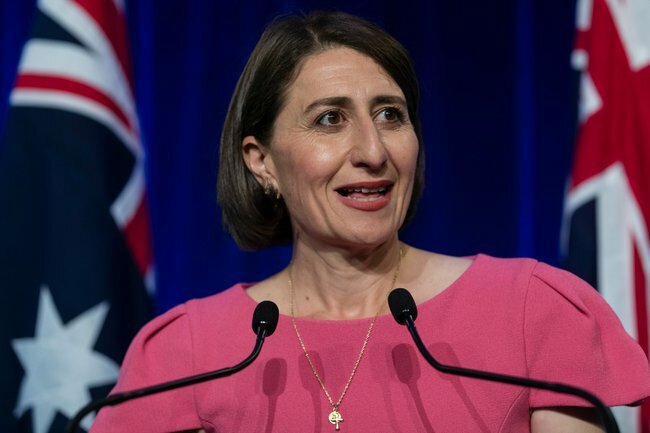 Gladys Berejiklian has thanked the people of NSW for re-electing her government – and for voting for a woman with a long surname to be premier. While several seats still hang in the balance, Ms Berejiklian said the Liberal Party would concede no seats lost on Saturday evening. “First and foremost, I want to thank the people of this great state for having confidence in me and my government,” she said after claiming victory in Saturday’s election. She said her priorities would be to continue to provide a strong budget for the projects, infrastructure and services for the state. “We will continue to govern for all of us, for all of you,” Ms Berejiklian said. Ms Berejiklian, whose family migrated to Australia from Armenia, said she was most proud that “no matter what your background … everyone has the chance to be their best”. “I am most proud of the state of NSW, I’m incredibly proud of the wonderful place in which we live,” she said. Thousands of Liberal supporters – many chanting “four more years” – and Prime Minister Scott Morrison and former PM John Howard were on hand for the victory celebrations. The coalition was returned for a third term on Saturday, but it’s still to be determined whether it will be able to govern in its own right or will depend on the three expected independents. Ms Berejiklian said she would work with the three independents – Wagga Wagga’s Joe McGirr, Sydney’s Alex Greenwich and Port Macquarie’s Greg Piper – regardless of the result. “Whether or not my government is a majority government or a minority government, we will work closely with the three independents that are elected to the NSW parliament,” she said. Before Ms Berejiklian’s hero’s entrance, Mr Morrison told the crowd her Liberal government was “a great advertisement for the Liberal Party” and promised to celebrate another win in two months time after the federal election. “Well fellow Liberals, how good is Gladys Berejiklian?” he asked the crowd to loud cheers. Ms Berejiklian thanked her family, staff, volunteers and party workers for their efforts to return the government. Her mother and father, Krikor and Arsha, and sisters Rita and Mary, were among those celebrating below the stage. She also praised Nationals leader and Deputy Premier John Barilaro and Treasurer Dominic Perrottet for their efforts.